Since 1492 when the Sephardic Jews were expelled from Spain, the Spanish-Jewish community was dispersed throughout North Africa, the Eastern Mediterranean and Western Europe. The emigration process was hard and lasted for generations. The historical and cultural evolution of each of these three groups was distinct and depended on the political conditions of the country of destination. The Sephardim that travelled towards the Eastern Mediterranean (at that time the Ottoman Empire, now the countries of Turkey, Greece, Bulgaria, Macedonia, Bosnia, Serbia, Croatia, etc…) were able to preserve their traditions, language and, of course, their Sephardic songs. Given the political circumstances of the Ottoman Empire, those who went there were able to keep their identity intact for many years. One of the Sephardic cultural features that has sparked most interest is their musical repertoire. Sephardic songs passed down from generation to generation and continued taking on new melodies and lyrics from wherever they travelled. The figure of the Sephardic woman is very important in practically all of the songs, both as central character and as a transmitter of the songs. For that reason, we cannot fully understand Sephardic music without considering three fundamental aspects: firstly, its Spanish roots; secondly, the mixture of different cultures in which it coexisted in exile; and thirdly, and very importantly, it is in fact from the Jewish culture. All of these aspects have enriched Sephardic songs. If we add the gender perspective to this and focus on the important role of the woman, we can really see the great uniqueness of this musical repertoire. Romances are stories(often fairly extensive ones) in the form of song and are very common in the traditional Spanish spoken-word repertoire. Their characters are, in general, kings, queens, princesses, nobles or knights who belonged to medieval society. The figure of the Sephardic woman is very important as a transmitter of the Romance songbook. Romances were also used as stories for older children and as lullabies for babies. On the contrary, Coplas are a clear product of Sephardic creation. Their period of splendour occurred in the diaspora between the 17th and 19thcenturies, although more modern Coplas also exist. Canciones or Canticas (as they are known in the Middle East) represent the Sephardic lyrical poetry whose most common theme is love. Canticas that speak of a beautiful woman, that describe a mother giving advice to her daughter and ones that talk about fidelity and infidelity or laments on love or desire are abundant. Lyrics in Canciones, unlike Romances or Coplas, do not have a continuous story line, nor do they have a fixed logical order. For that reason, it is very common for them to borrow verses from other songs. In any case, be it Romance, Copla or Canción the female figure plays a central role in almost all of the stories. Among the various Sephardic music groups that work with these melodies, we have Evoéh. Created by Ariana Barrabés (voice) and Jesús Olivares (guitar), Evoéh formed with the intention of providing a new vision of the music and poetry from their surroundings. In 2016 their third album Cantadme galanica: la magia en la voz de la mujer sefardí was released; the project was based on research that Ariana Barrabés had carried out on Sephardic songs. Ariana is specialized in popular and traditional music and has a great interest in melodies that pass down orally. Her final year university project put her in contact with great scholars and experts from this field; people such as Susana Weich-Shahak, Judith R. Cohen, Paloma Díaz-Mas, Ascensión Mazuela Anguita, etc. These melodies, which spread throughout the Mediterranean, were a source of inspiration for the project. The Galana represents all of the women who, hidden from the public eye, passed these songs down from generation to generation. Cantadme galanica is a small and humble homage to the work of all the women, not only those of Sephardic origin, but to all women who despite so many obstacles to express themselves have managed to keep their legacy very much alive. Going beyond nations and religions, they have managed to make many feel both an admiration and a desire to get even closer to this legacy. That is the magic in the voice of the Sephardic woman. Women not only have central roles (as daughters, mothers, mother-in-laws, godmothers, faithful and unfaithful wives, beauties, girlfriends…) in the majority of the songs, but they are also the transmitters and carriers of them. Both in the middle ages and in the periods after the expelling of the Jews from the Iberian Peninsula, the exclusive meeting of women was common. Mothers taught daughters the songs of plañideras(endechaderas or oinaderas), songs to make their children sleep, songs for celebrations and prikantes (healing spells through the spoken word)to cure ailments. Women’s limited musical role in the public limelight (except at times when it was perhaps not appropriate for men to partake – as was the case with the songs of the plañideras) caused them, behind closed doors, to develop a “female culture” isolated from a world which was ruled by men. A culture that was censured, scorned and discredited, accused of witchcraft and condemned during darker times. In the Sephardic tradition is not common to find lullabies because the romances and their long stories were the genre most used to sleep the baby and entertain the other children. However, I could not miss this beautiful lullaby in the repertoire. Durme, durme, hermozo hijico. Durme durme, con savor. Cerra tus luzíos ojicos. Durme durme, con savor. A la scola tú te irás y la Ley t’ambezarás*. A Sephardic Copla in the Rhodes style. It tells of seven ways to cook an eggplant (merenjena or berenjena), a very special vegetable in the Sephardic cuisine. Handwritten versions amount to about thirty-five different ways to prepare it. The amusing sentence “A mi tío Cerasí, que le agrada beber vino: con el vino, vino, vino, mucho y bien a él le vino” is placed between each verse. In a polyphonic vocal section sung a cappella, Evoéh added the Sephardic songs “Descanso de mi vida”, “Esa montaña d’enfrente” and “Durme, durme” (not the same as “Durme, durme hermozo hijico”). Siete modos de guisados se guisa la merenjena. La primera de las guisá es la vava de Elena. Ya la hace bocaditos y la mete’n una cena. Esta comida la llaman comida de merenjena. La cavaca por ariento y la hinchi d’aromat. Esta comida la llaman la comida la dolmá. La tracera que la guisa es mi prima Ester de Chiote. La cavaca por arientro y la hinchi d’arroz moti. Esta comida la llaman la comida la alomondrote. La alburnia es saborida en color y en golor. Ven haremos una cena mos gozaremos los dos. Antes que venga el gosano y le quite la sabor. En las mesas de las fiestas siempre brilla el jandrajo. Ya l’hacemos pastelicos, ellos brillan en los platos. Asperando a ser servidos con los güevos jaminados. La salata maljasina es pastosa y saborida. Estos platos acompañan a los rostros de gallinas. La setena que la guise es mejor y más janina. La prepara Filisti, la hija de la vecina. con aceite y pimienta ya la llama una meyina. This is one of the most famous songs among the Middle-Eastern Sephardim. Its subject-matter offers many similarities to Spanish medieval poetry. There are many versions with varying melodies and words. Two of these are mixed on Evoéh’s version. el sol del enverano m’hizo a mi ansí. Morenica y graciosica y mavra matiamu*. de pasear galana mi color pedrí. Dizime galana si querés venir. Los velos tengo fuertes, no puedo venir. Morena me llama, el hijo del rey. Si otra vez me llama me vo yo con él. Also known as “la guirnalda de rosas”. Due to its healing and protective powers, the ruda plant is very important both in traditional medicine and in Sephardic ethnomedicine. The magic in the voice of the prikanteras (Sephardic healers who used verbal formulas called prikantes for their rituals) inspired the vocal play in Evoéh’s version. Una matica de ruda, una matica de flor. – Hija mía, mi querida, disme a mí quién te la dio. – Me la dio un mancevico que de mí se enamoró. – Hija mía, mi querida, no te eches a perdición. A romance song with a theme that is well-known throughout Europe. The female central character asks a knight if he has news of her husband (often absent due to war). The knight turns out to be her husband and in not been recognised, takes advantage of the situation to test the strength of his wife’s faithfulness. Don Amadí might allude to the legendary knight-errant Amadís de Gaula..
Arbolera, arbolera, arbolera tan gentil. ¿Si verías al mi marido, si pasaría por aquí? ¿Onde vas vos cavallero, onde vas vos por aquí? ¿Si verías al mi marido, a mi marido Amadí? – ¿Cualo das, la mi señora, que vo lo traigan aquí? – Daré yo mis tres doblones que me quedaron de Amadí. – Poco das, la mi señora, que vo lo traigan aquí. – Daré yo mis tres molinos que me quedaron de Amadí. – Mal año al caballero que tal pensó él por mí. – No maldigas, la mi señora, que so vuestro Amadí. Se tomaron de la mano, que por holgar y por dormir. A Sephardic lyrical song. In the same vain as a Turkish traditional song, the verses contain no continuity between them. – Hija mía mi querida, amán, amán, no te eches a la mar. Que la mar está en fortuna, mira que te va a llevar. – Que me lleve que me traiga, amán, amán, siete picos de hondor. Que m’engluta peixe preto para salvar del amor. Una fuente frente de otra, amán, amán, bebí agua y me afertí. Dile, niña, a tu madre que te quero para mí. A song about heartbreak which, due to it strange rhythm,is linked to the traditional Italian tarantella. Cuatro años d’amor cortezimos los dos. A la fin salvación no tuvimos los dos. – Me dixiste que t’aspere en el bodre de la mar. T’asperí y no venites. Yo me metí a llorar. – Hablame conforme hablas no sos hija d’engañar. Y si es por la tu mamá yo la haré de aceptar. – No m’espanto de mi madre, ni menos de mi papá. M’espanto de ti querido, no me dexes engañar. The husband sets off for war and his wife stays to take care of the kids and the house. The subject-matter is well-known in popular songs, not only in Sephardic ones. ¿Por qué lloras blanca niña, por qué lloras blanca flor? Lloro por vos caballero, que vos vas y me dejas. Me dejas niña y muchacha, chica y de poca edad. Tengo niños chiquiticos, lloran y demandan pan. Sephardic lyrical song. Another melody, the one from “La rosaenflorece” appears as an instrumental interlude. corazón ella no te dio para amar segundo. Adío, adío querida, no quero la vida, me l’amargates tú. Va, búscate otro amor. Aharva otras puertas. Aspera otro ardor, que para mí sos muerta. The title is common in various Spanish spoken-word traditions. Due to its beautiful melismatic lines, Evoéh gives it an air of taranto. de una mujer muy hermosa, linda de mi corazón. Yo me enamorí de noche, el lunar ya me engañó. Si esto era de día yo no ataba amor. sea de día con sol. 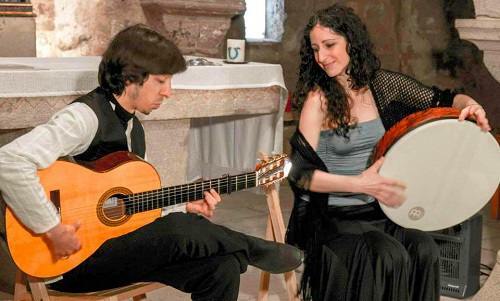 Of all the Sephardic songs arranged by Evoéh, “A la una nací yo”, is accompanied only by guitar in order to give it an air of an Andalusian petenera. A la una nací yo, a las dos m’engrandecí. A las tres tomí amante, a las cuatro me cazí. Disme niña dónde vienes, que te quiero conocer. Si tú no tienes amante, yo te haré de defender. Yéndome para la guerra, dos bezos al aire di. El uno es para mi madre, y el otro es para ti. Although this piece has different versions that remain current even until nowadays, Evoéh decided to recreate the music written by Alonso Mudarra in his Tres libros de música en cifra para vihuela from 1546. These mournful poems sung by the Sephardim are called endechas or oínas. Due to its subject-matter, this romance song was sung as an endecha. Women, usually semi-professional, who were called endechaderas or oinaderas, performed these songs. Lyrics from two different sources have been mixed together. cuando le vinieron nuevas de la muerte de Absalón. que mataron al mi hijo, al su hijo Absalón. – No te quisiera ver muerto sino vivo en mi prisión, Fili mi, Absalón. A hagiographic Copla that tells the story of the birth of the patriarch Abraham. This is one of the coplas sung at circumcision rituals for kids (it was Abraham who established this tradition). There are many differing versions of it, the spoken-word version being the shortest and most simplified. In this version,words from one of the traditional written texts are mixed with words from the most well-known spoken-word tradition. miraba en el cielo y en la estrellería. que había de nacer Avraham Avinu. que habíya de nacer Abraham Avinu. ¿De qué tenés la cara demudada? Ella ya sabía el bien que tenía. Finally, this courtship song from the Sephardic wedding repertoire inspired the title of the album. – Avrix mi galanica que ya va a amanecer. – Mi padre stá meldando, mos oyerá. matalde la luzezica, así se echará. – Mi madre está cuziendo, mos oyerá. pedrelde la agujica, así se echará. 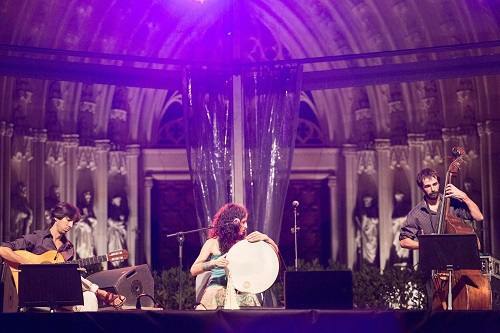 Evoéh reinterprets Sephardic music in two different musical line-ups, as a duet and as a sextet. As a duet, the lute and the guitar alternate and the voice is accompanied by the tambourine and a bowed psaltery. This duet takes us back to the intimacy of the family around the table; the place where the majority of the Sephardic songs were shared. As a sextet, Evoéh creates a mixture of different styles all within Mediterranean music and jazz. Together with the instruments from before the double bass, the piano and keyboards, the drums and the krakebs are introduced. In both line-ups, Evoéh works so that every one of the melodies has a different musical air that evokes the distinct Mediterranean regions. Every song that Evoéhreinterprets has its own personality, without losing the magic and the essence that the traditional spoken-word Sephardic melodies have all in themselves.